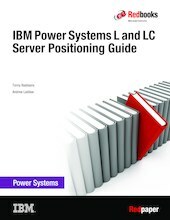 This IBM® Redpaper™ publication is written to assist you in locating the optimal server/workload fit within the IBM Power Systems™ L and IBM OpenPOWER LC product lines. IBM has announced several scale-out servers, and as a partner in the OpenPOWER organization, unique design characteristics that are engineered into the LC line have broadened the suite of available workloads beyond typical client OS hosting. This paper looks at the benefits of the Power Systems L servers and OpenPOWER LC servers, and how they are different, providing unique benefits for Enterprise workloads and use cases.